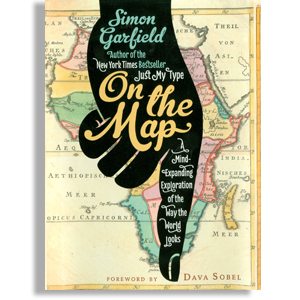 Simon Garfield • Gotham Books, NY, 2013, 464 pp. Maps — the two-dimensional representation of our 3-D world — get a loving requiem that starts in the dust (literally: the first maps were likely drawn in the sand). From there, author Simon Garfield takes us for an entertaining journey through Ptolemy and Mercator, onward to the first strip maps that enabled people to tour Europe guide-free, and through the Fodor guides and their modern, Lonely-Planet descendants. Garfield takes detours into maps of buried treasure, before inexorably running aground with the map-killing technology of GPS. I would have opted for tighter editing, and also for an explication of how the early explorers — Captain James Cook, Chris Columbus, and their ilk — actually made their maps. If longitude was sloppy until the late 18th century, how did the seafarers chart uncharted waters? Garfield tells us that Columbus “was working from a system of ‘dead reckoning,’ navigating by a nervous combination of compass and stars, making exact measurement impossible.” Sailors, in fact, dead reckon by combining compass readings with speed estimates based on bits of wood thrown from the boat. As the tale reaches the modern era, Garfield recounts master map thieves slashing their way through map libraries. Best practice: you will be seen as trustworthy if you surreptitiously “drop” a big banknote on the floor, then deliver it to the librarian. The author never met a map he didn’t like, and that’s why his conclusion is so predictably bitter. Inevitably, a map book must dead-end with the modern replacement for the map: the digital device. Soon enough, maps will be, paradoxically, both pervasive and obsolete.